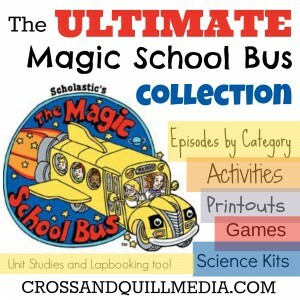 Visit Cross and Quill Media to find the free Ultimate Magic School Bus Collection for use as science curriculum in your homeschool. You’ll find free Magic School Bus printables, lapbooks, and more. Amazon frequently has the complete Magic School Bus series on sale for 50% off or more, so keep an eye on it if you’re interested in purchasing your own set. Click here for more free homeschool science resources!